This is a mid century modern set of 4 dining chairs from the Broyhill Brasilia collection. The chairs have solid wood frames with sculpted tall backs that display their signature arches, and newly covered seats in sleek black naugahyde. Dimensions: seat width: 20″, seat depth: 17″, seat height: 18″, back height: 37″. 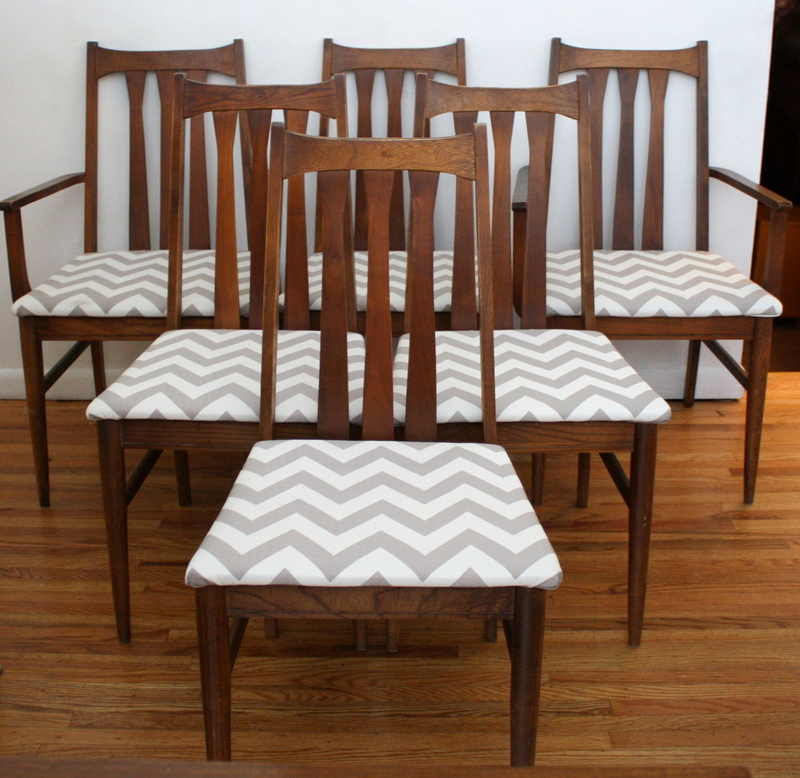 These are 2 sets of mid century modern dining chairs with solid walnut bases and upholstered seats. 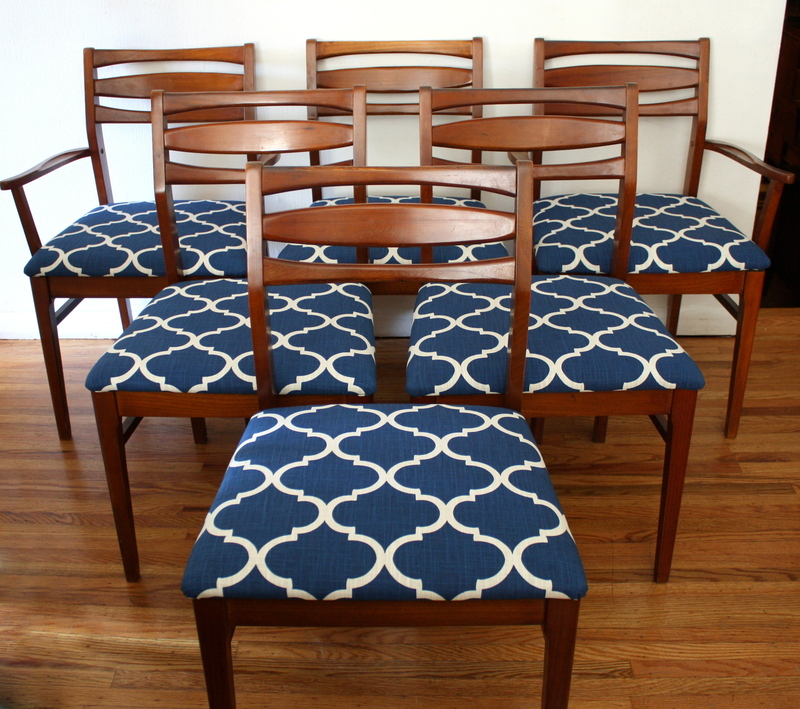 The first set set has 6 chairs: 2 arm and 4 side chairs, with a horizontal slatted back and newly recovered in a cobalt blue fabric. Dimensions: 19.5″ seat width, 17.5″ seat depth, 18″ seat height, 32.5″back height. The second dining set newly recovered seats in a chevron fabric. The set of 6 chairs has 2 arm and 4 side chairs with a vertical slatted design. Dimensions: seat width:18.5″, seat depth: 16″, seat height: 18″, back height: 36.5″. Both dining chair sets are sold. This is a mid century modern dining set in the style of Heywood Wakefield with the lighter blond wood and beautiful curves. The set includes a solid wood dining table with tapered legs, an extension leaf, and 4 upholstered solid wood chairs. There are 3 side chairs and 1 arm chair which is reflected in the price. The entire set is in great condition. This is a mid century modern dining table that is solid wood with an mcm formica top. It has an extension leaf and beautiful tapered legs. The sides of the table curve out a little, adding a nice accent to its design. The chairs are sold.